Heavenly Muffins is a small cattery nestled in the mountains of Eastern Idaho. We are working to provide the perfect RagaMuffin kitten. Our kittens are raised underfoot, which helps make them loveable, adorable lap cats that the RagaMuffin breed is known for. We hope you will enjoy learning why the RagaMuffins are such a wonderful breed of cat. The RagaMuffin is a cat we selectively breed to produce a kitten with the loving and docile disposition that some say is the "Teddy Bear" of the cat world. Cat Fancy Magazine described them as "gentle giants". The sweet childlike temperament of these wonderful felines make them an ideal pet and cherished friend. We welcome your inquires and would be happy to answer any questions you may have. Please feel free to email us for a "cat chat" as we love to communicate with fellow cat lovers. We have a limited number of kittens available each year as we are a small cattery that focuses on quality and not quantity. 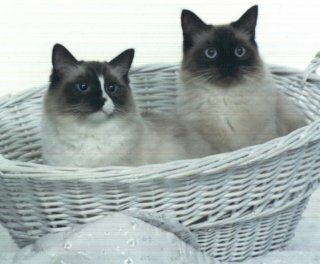 If we do not happen to have a kitten available, we are always happy to assist you in locating a reputable breeder that may. If you would like us to contact you in the future when there are kittens available please feel free to send us your information. We feel very blessed to be able to share our lives with our RagaMuffins. They are a constant source of joy and we are thankful to have the opportunity to give them unconditional love and respect that all creatures deserve. They truly are Heavenly Muffins.